Muṣaṣir Assyrian Template:"lang and variants, including Mutsatsir, Akkadian for Exit of the Serpent/Snake ), in Urartian Ardini was an ancient city of Urartu, attested in Assyrian sources of the 9th and 8th centuries BC. 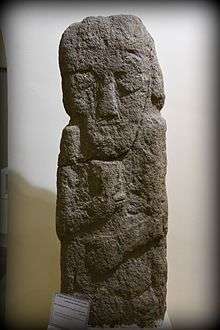 Sandstone statue of a man or deity. The statue belonged to the Musasir Kingdom. Urartian period, 1st millennium BCE. Precise provenance of excavation is unknown. Erbil Civilization Museum, Iraqi Kurdistan. It was acquired by the Urartian King Ishpuini ca. 800 BC (see the Kelashin Stele). The city's tutelary deity was dḪaldi. The name Musasir in Akkadian means exit of the serpent. ↑ Lynch, H.F.B. (1901). "Armenia: travels and studies". Retrieved 2009-09-08. 1 First capital city until 832 B.C. 2 Second capital city from 832 B.C.